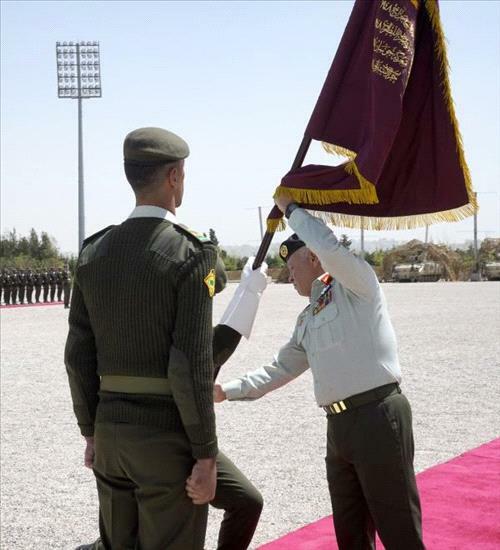 AMMONNEWS - His Majesty King Abdullah, the Supreme Commander of the Jordan Armed Forces-Arab Army, accompanied by His Royal Highness Crown Prince Al Hussein bin Abdullah II, on Tuesday presented the King’s Colours to the 2nd Al Hussein Mechanised Battalion, of the 90th King Abdullah I Mechanised Brigade, a formation of the Eastern Military Region. The handing over of the banner, a tradition that started in September 2015, is the highest military honour awarded to an army unit in appreciation of its role in defending the homeland. Since its formation in 1942, 170 personnel of the 2nd Al Hussein Mechanised Battalion gave their lives as martyrs in the line of duty. King Abdullah, accompanied by Crown Prince Al Hussein and received by Chairman of the Joint Chiefs of Staff Lt. Gen. Mahmoud Freihat and senior army officers, was greeted at Al Rayah parade ground at the Royal Hashemite Court with a 21-gun salute. Royal family members and senior officials and officers attended the ceremony.